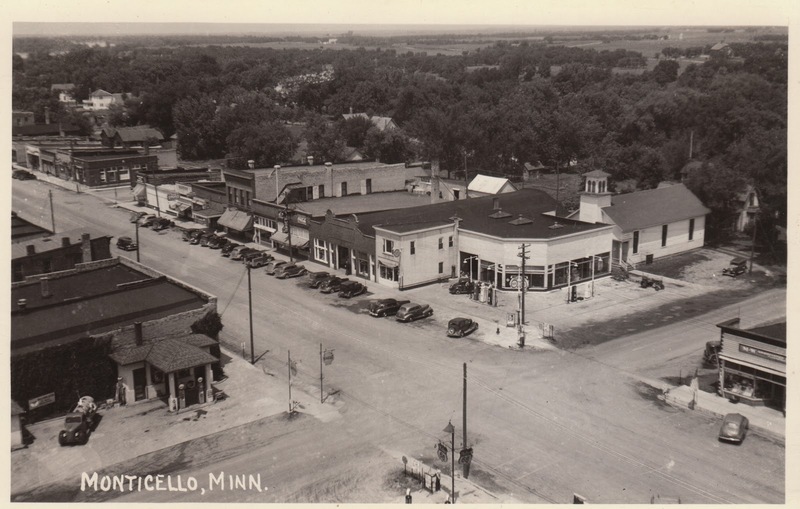 Snapshot that appears to be from the top of the old Monticello water tower that has since been torn down. This is looking northwest at the intersection of 75 and 25. I am unsure of the era. 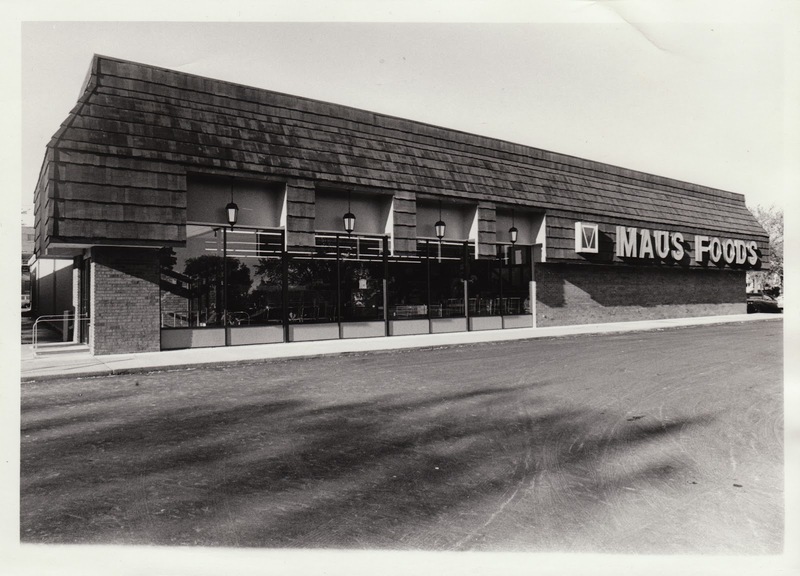 Maus Food Super Valu Market at 112 West Broadway. 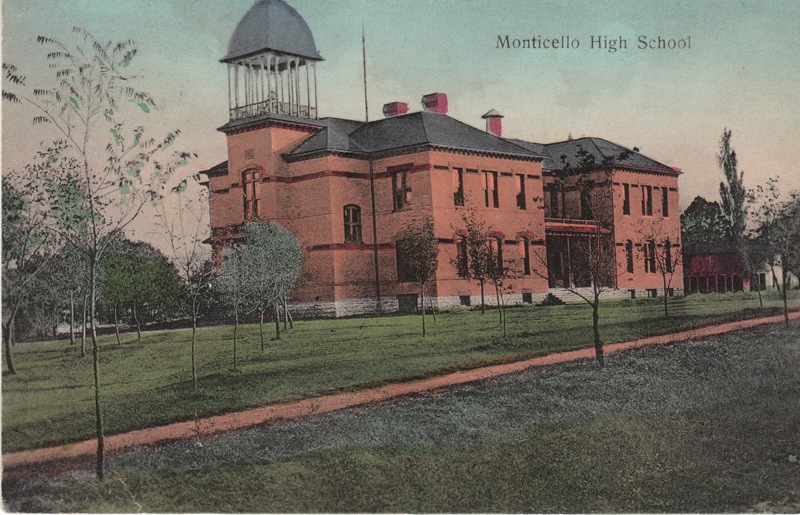 Undated and unmailed post card of Monticello High School which went on to be Oakwood Elementary. 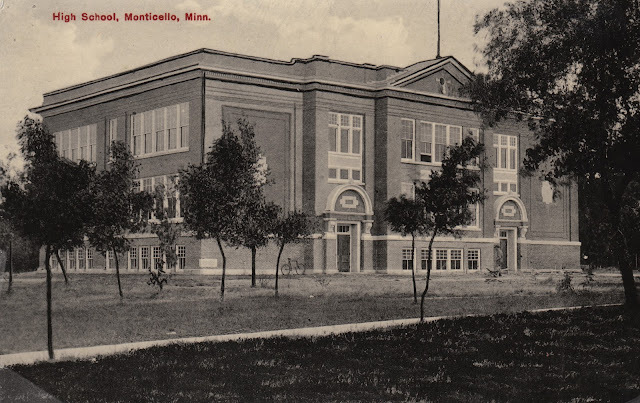 Built in 1909 and demolished in 1980. This is before the gym was added on to the north side of the existing building. Postcard dated May 7 1908 of Broadway in Monticello Minnesota. 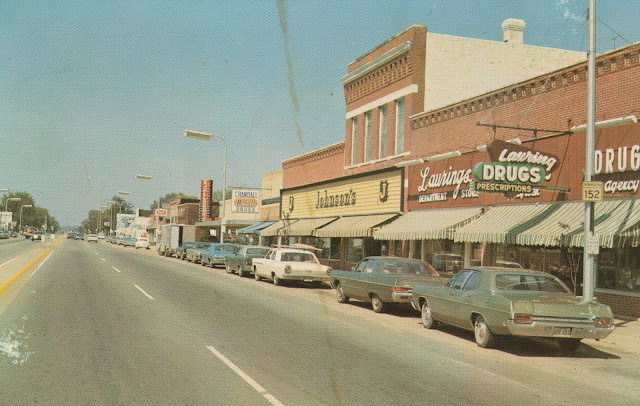 I think this is 1 block west of Hwy 25, from Walnut St looking east. 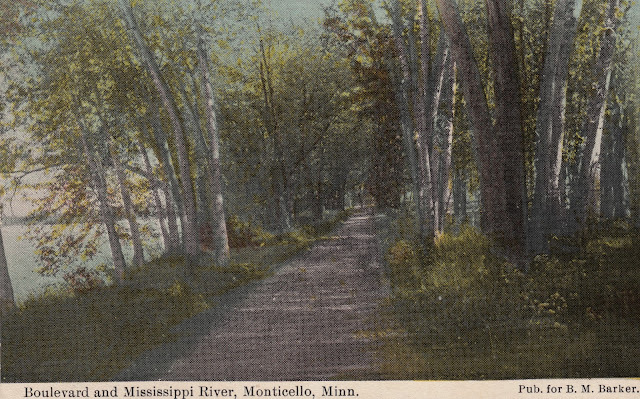 Unused postcard but dated Sept 30 1906. 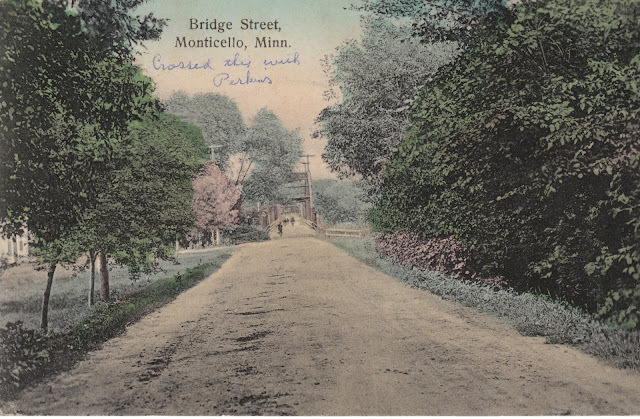 I think this is at Walnut St and Broadway looking east. Not sure what cemetery they are pointing out. 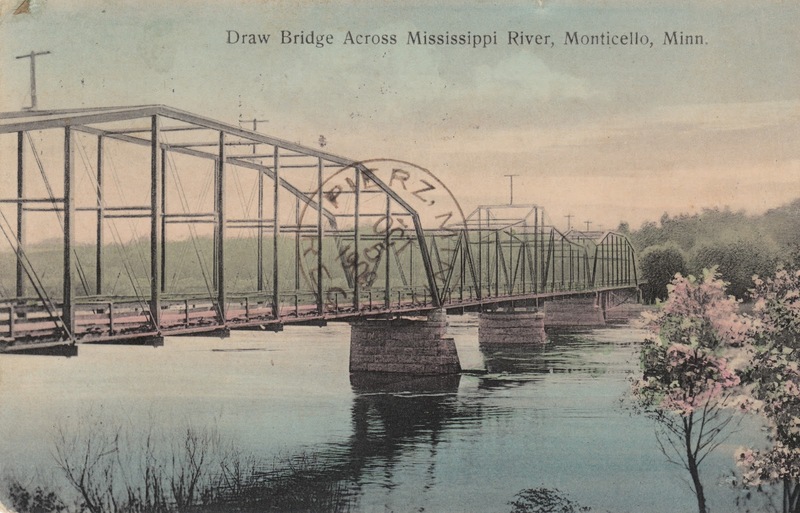 Postcard date Feb 1 1909. 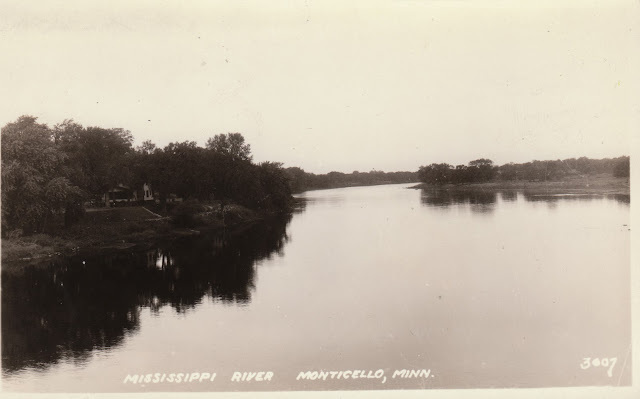 I think its looking north towards the Mississippi Bridge. 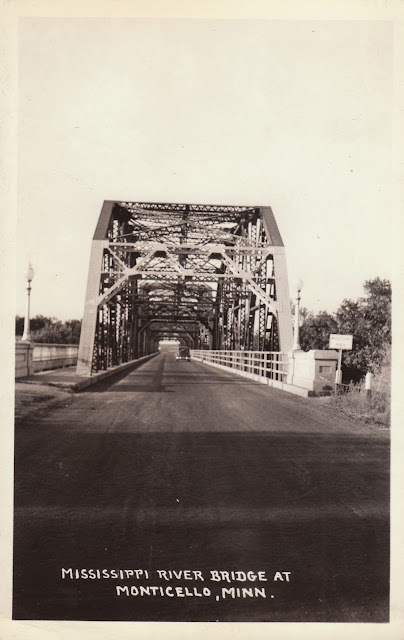 Not sure if it is the crossing at Walnut or 25. 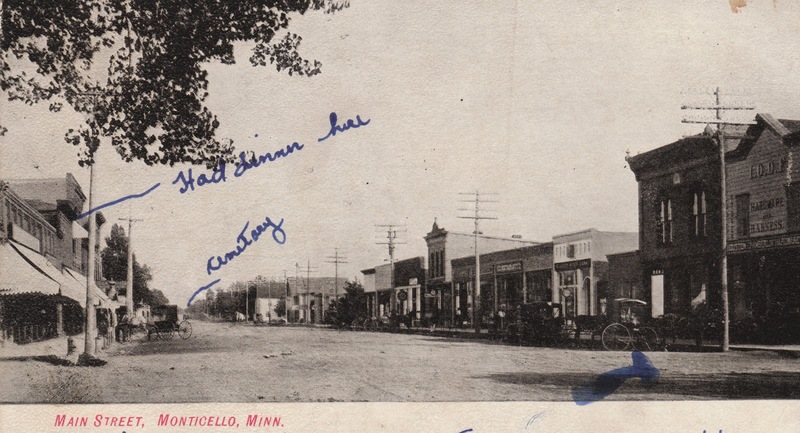 Postcard dated Sept 10 1920 of the west 100 block of the north side of Broadway. 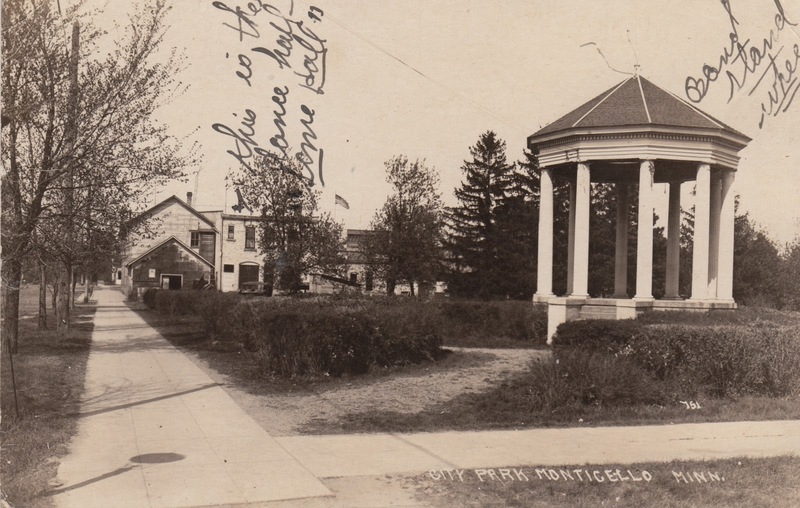 This is an unmailed undated postcard showing the bandstand that used to be at the NE corner of Walnut and West 3rd St. This is now a municipal parking lot. 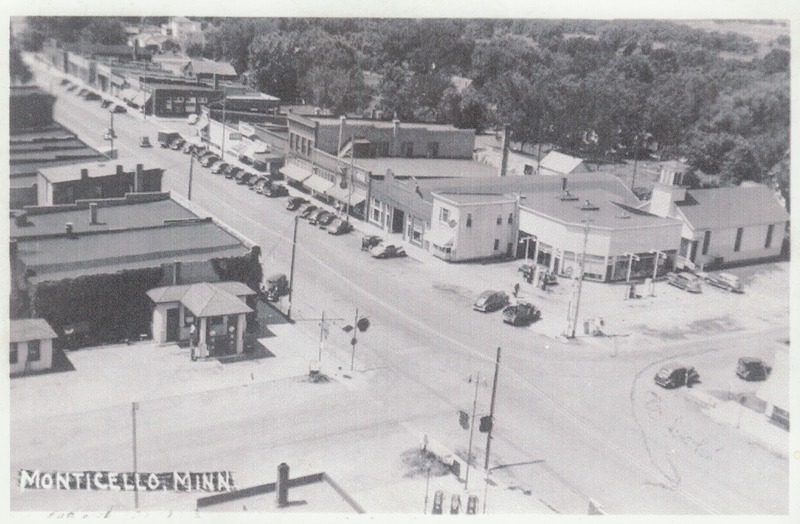 The building in the distance to the left was the Figs it Shop, Dinos Deli and now the Cornerstone Deli. There is a note that mentions something about a dance hall in one of those buildings. Postcard postmarked April 24 1914 of Methodist Church on 300 west 4th street, which has been moved south about 2 blocks and now houses Swan River Montessori School. Postcard dated Dec 29 1915 showing the 100 west block on the north side of broadway. 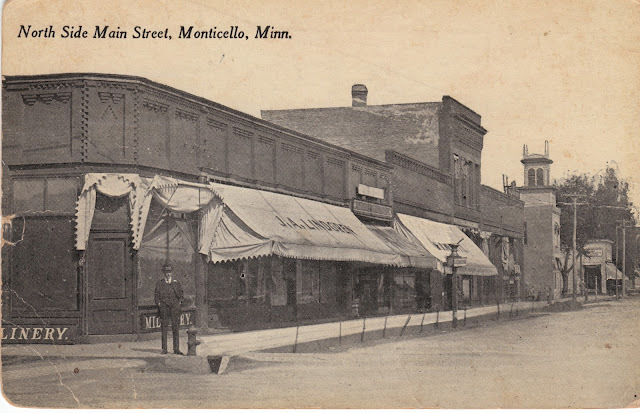 The closest building is Lindgren & Roman The New Cash Store. 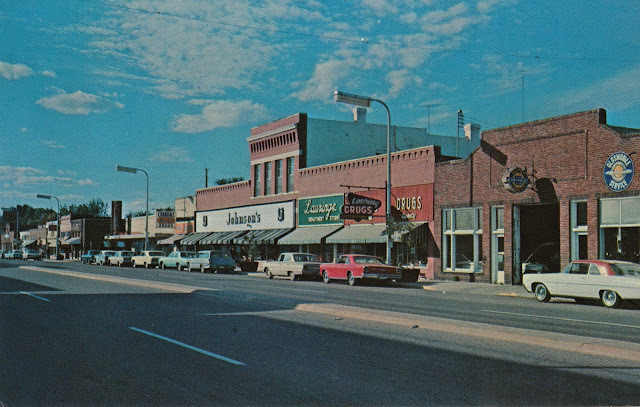 The tallest building with the red brick front is most recently remember as the Johnson Department Store. Postcard dated Jan 23 1911. 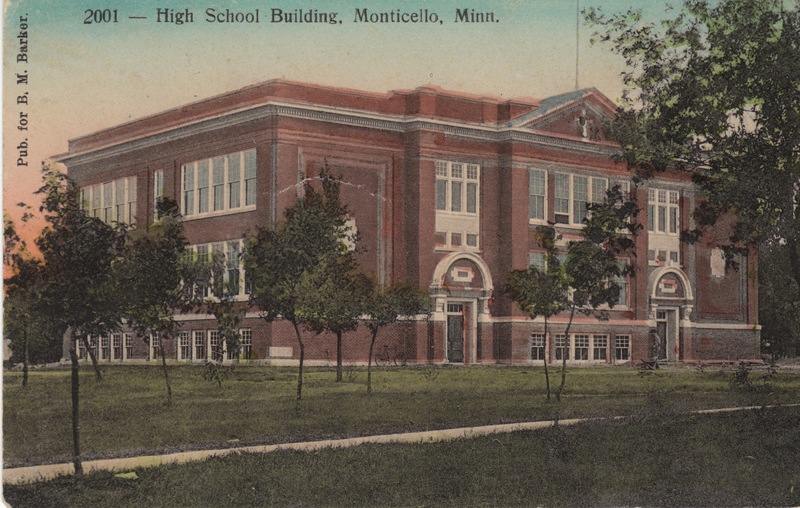 Monticello High School at Oakwood located between Pine and Walnut and 3rd and 4th street. 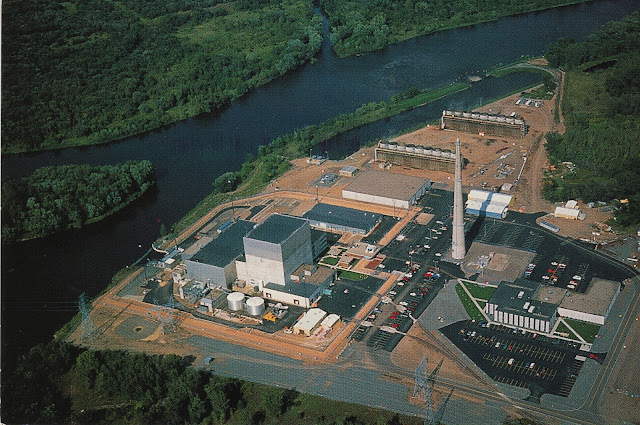 This picture was taken before the gym was added on to this portion. 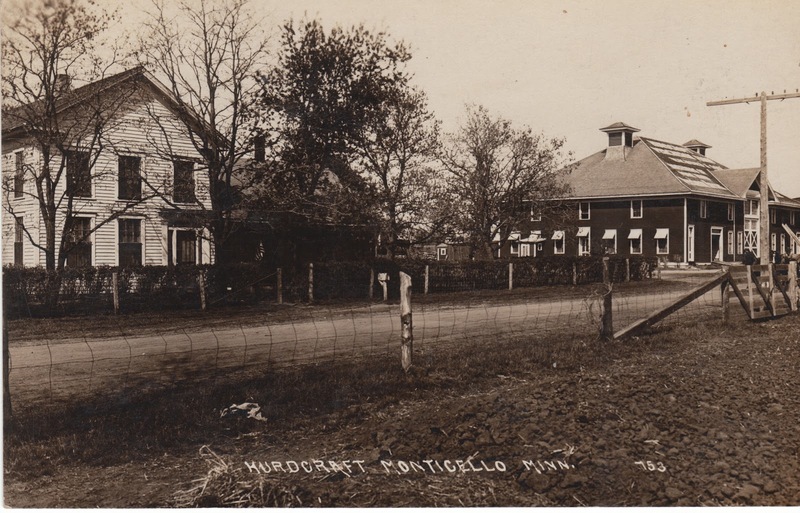 Unused undated Post care of the Hurdcroft farm most recently wellknown as the Curtis and Anna Mae Hoglund home. 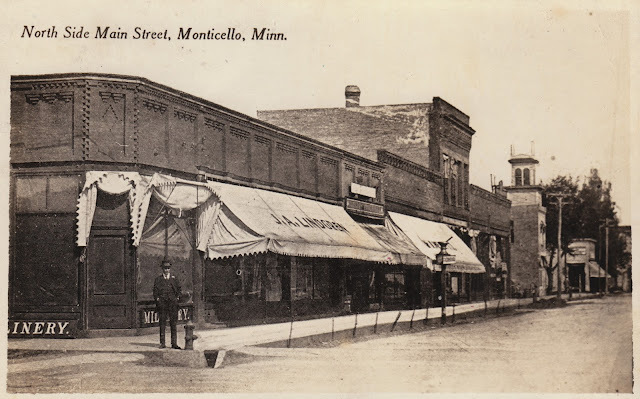 The white building was the home for the Hoglund Family and the darker building int he distance was an old streetcar building from Mpls that was moved out to Monticello. This location is just north of the current Super Target location across Hwy 75. 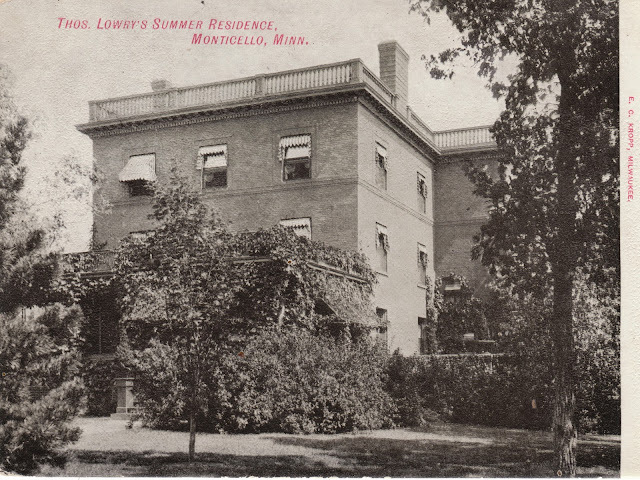 The home was recently burned down by the Monticello Fire department as a controlled burn. 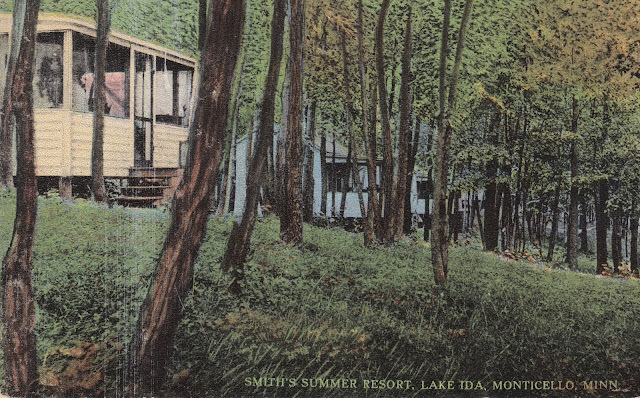 Unused undated postcard of the Lowry Summer Residence. 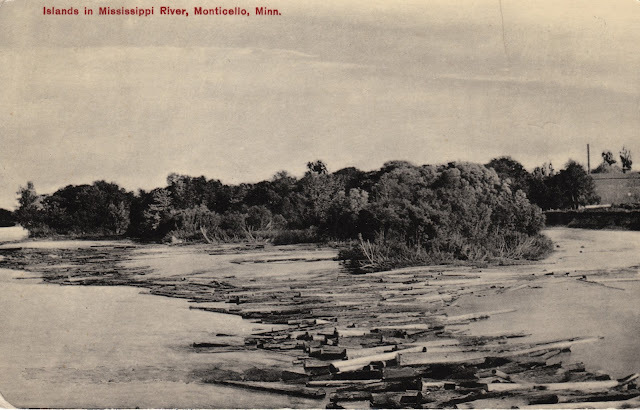 It was the location of Dinos Other World restaurant and was where the Monticello wastewater treatment plant is now. 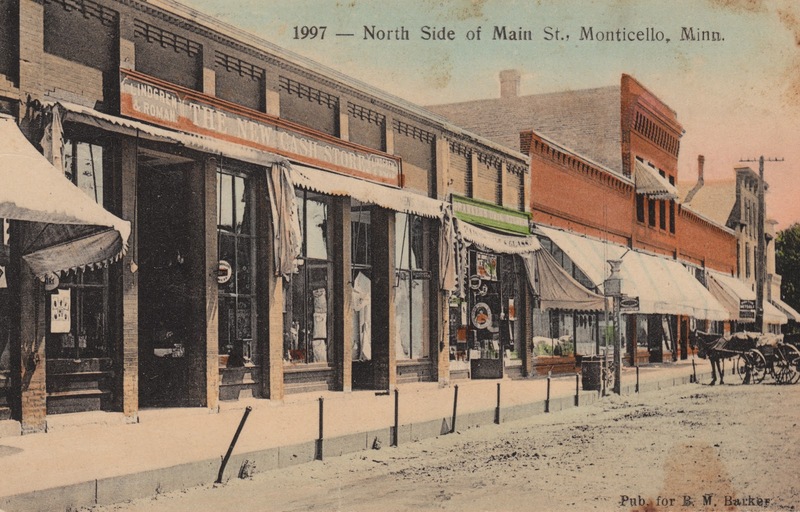 Unused postcard of Broadway in Monticello. It appears that this picture was taken about 1.5 blocks west of 25 and 75 looking to the east. By the looks of the cars this would be 1930s or earlier. 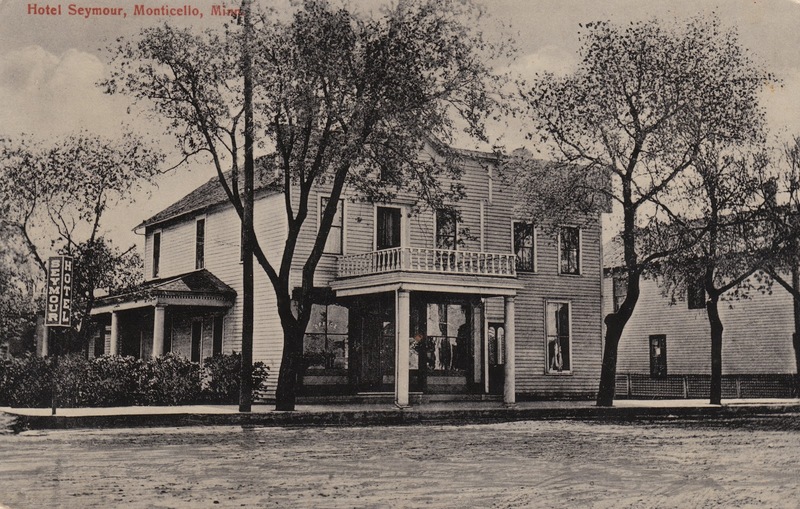 Postcard dated Jan 1 1908 of the Commercial Hotel. 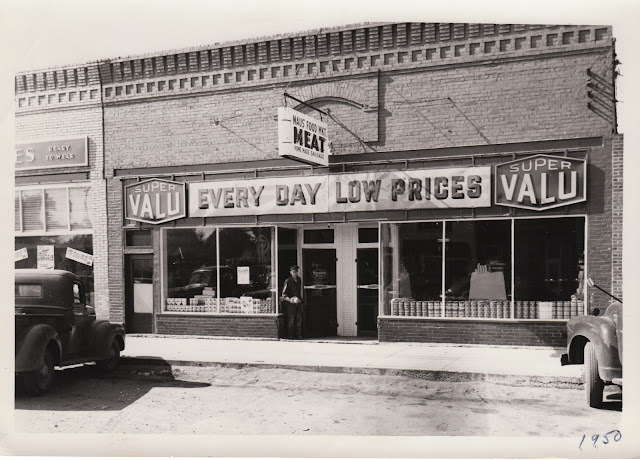 The sign above the small door reads "Unison Cigars 5¢" unsure of the location. Anyone? Postcard dated Sept 1920, illegible postmark. Northside of 100 block of west broadway. 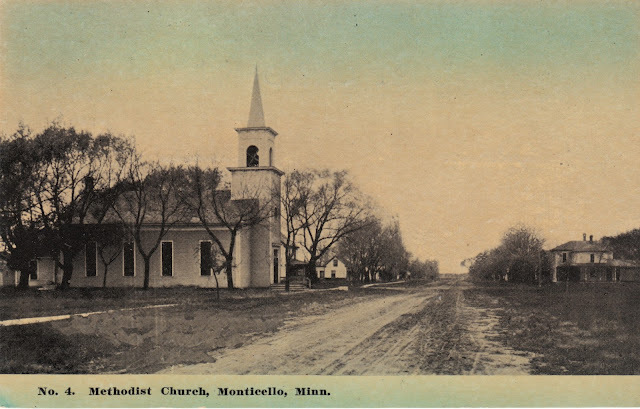 Unused Postcard of The north side of the 100 block of west Broadway in Monticello Minnesota. 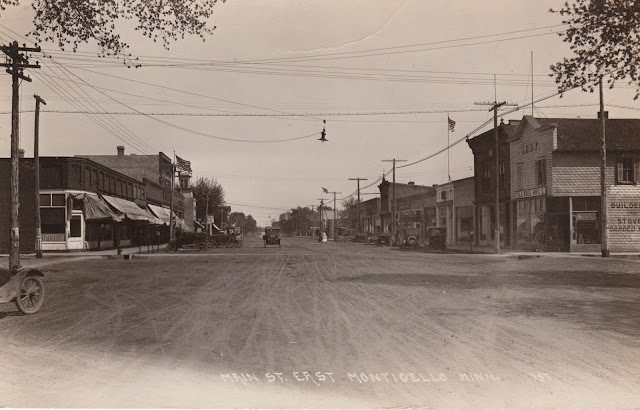 Notice the street lights. Remember them? Visible on the right is Lauring Drug and then Johnsons. Undated postcard of the old River Road entrance to Monticello from the east that came in behind the current wastewater treatment plant and hospital. 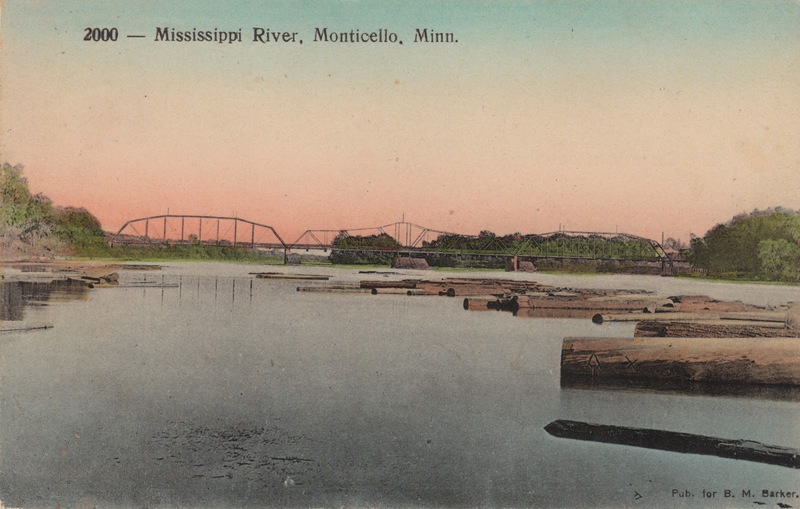 Postcard postmarked Jul 2 1907. Taken from a down stream of the Monticello bridge across the Mississippi. 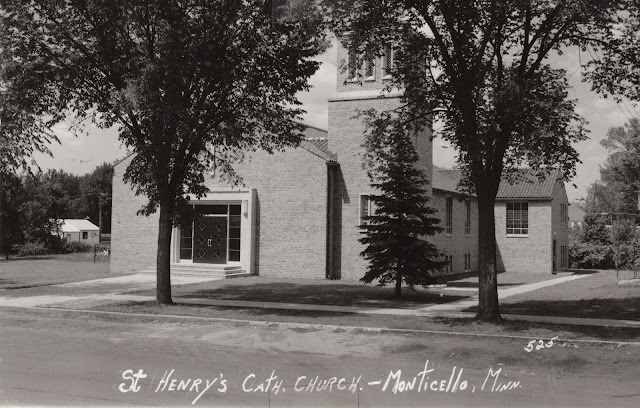 St Henry Catholic Church on west 4th street in Monticello before the nuns house was built. 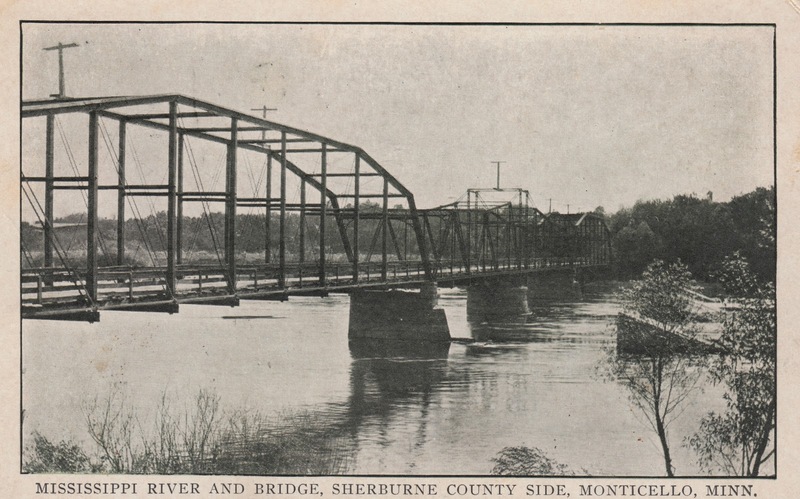 Anyone have an idea what year this could be? When was the nuns home built? 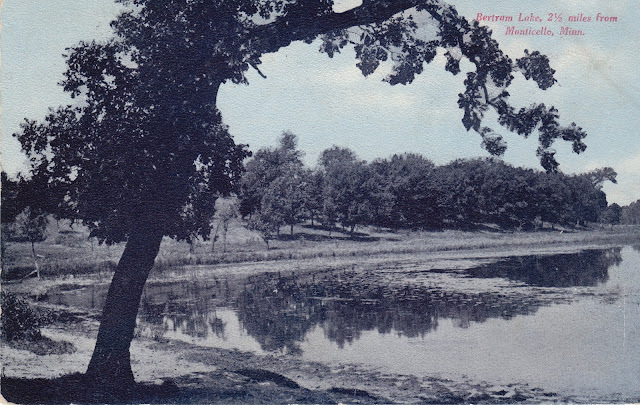 Postcard of Bertram Lake southwest of Monticello with postmark of Oct 6 1957? 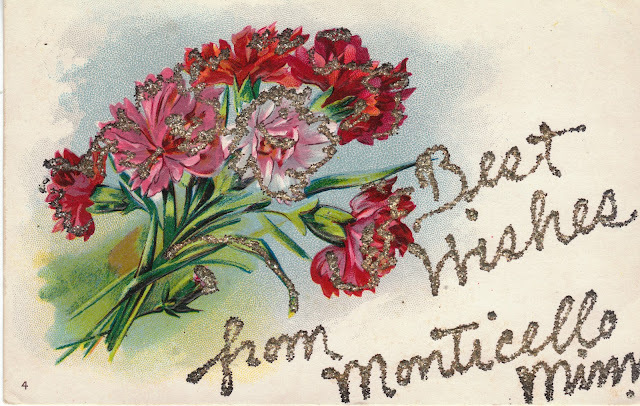 Postcard Postmarked Oct 7 no year. Appears to be upstream from the Sherburne county side. Unused Undated Postcard of the islands in the Mississippi River just down stream from the Hwy 25 bridge. Postcard postdated Feb 13 1910. 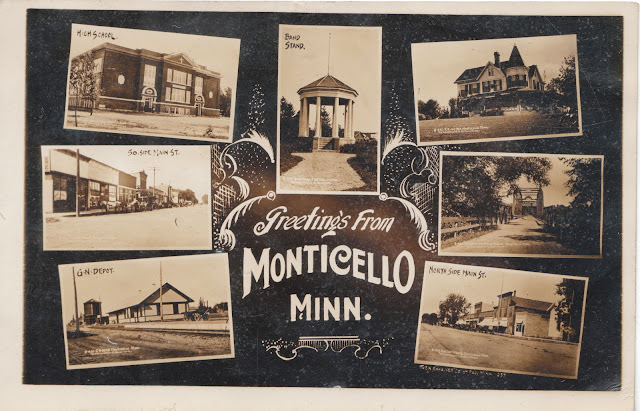 Assorted pics of Monticello landmarks. 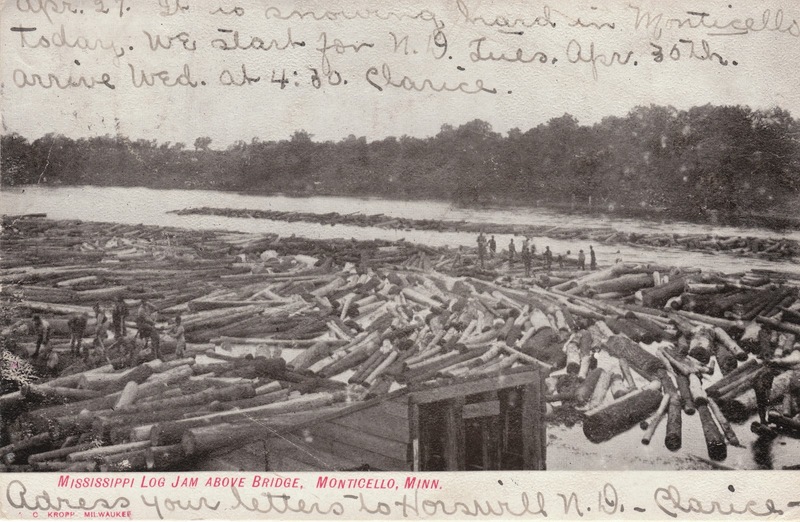 Clockwise from top right. Rand Mansion. 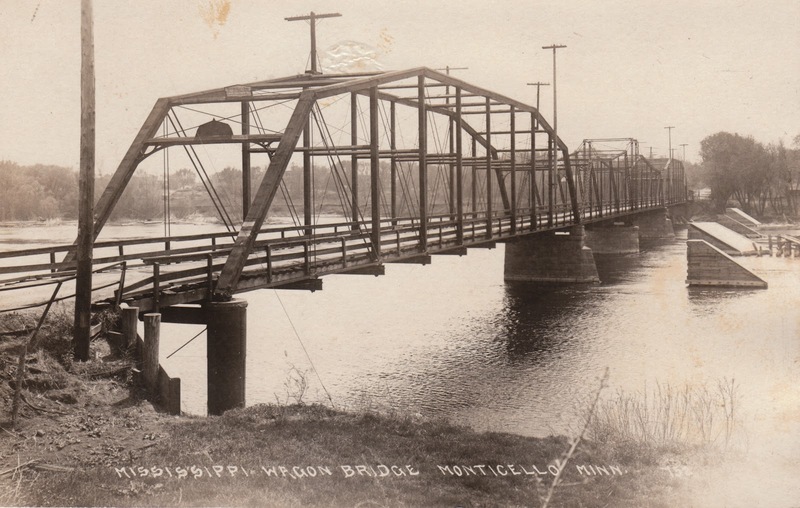 Older Mississippi River bridge. 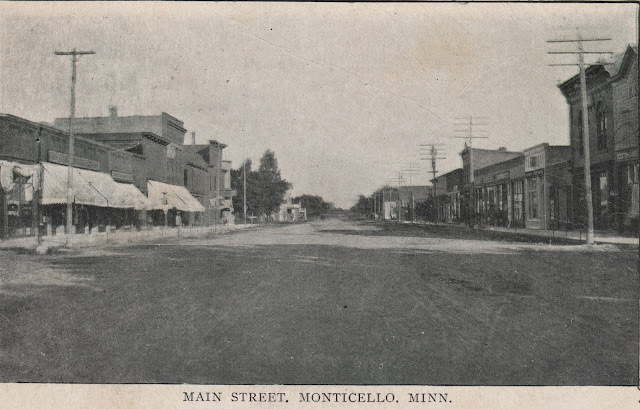 North side of broadway. Postcard of Hotel Seymour dated Sept 7 1912. Not sure where this was located at this point. 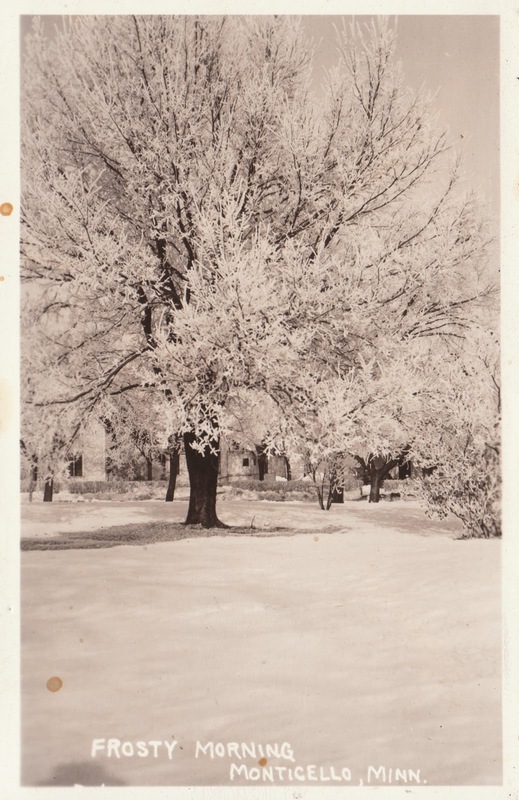 Possibly at the SW corner of Walnut and West Broadway where the Foster Insurance office is. 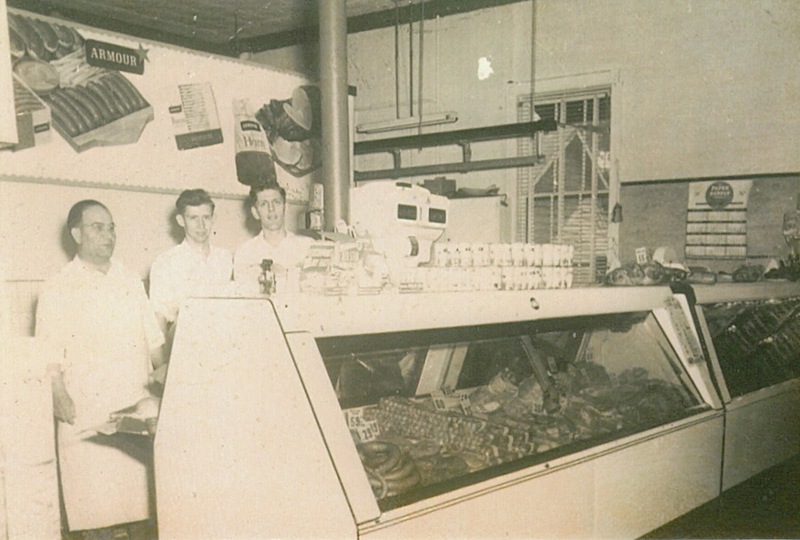 Snapshot of George Maus of Maus Foods on the left and possibly Jim Stokes and Harlow Jones. Unsure of exact location of this picture. 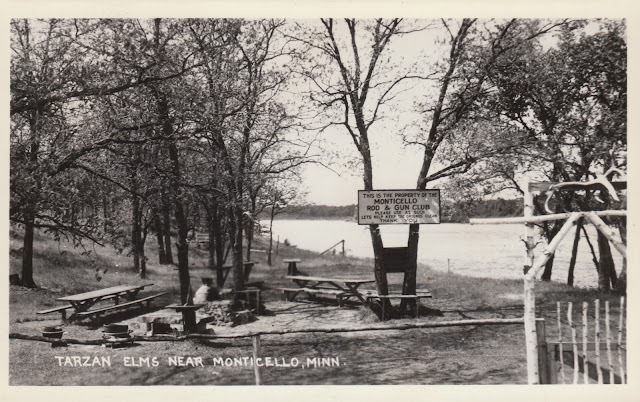 Postcard dated Aug 1 1950 of Tarzan Elms Monticello Rod & Gun Club that was located about a mile upriver from the Monticello Nuclear plant. 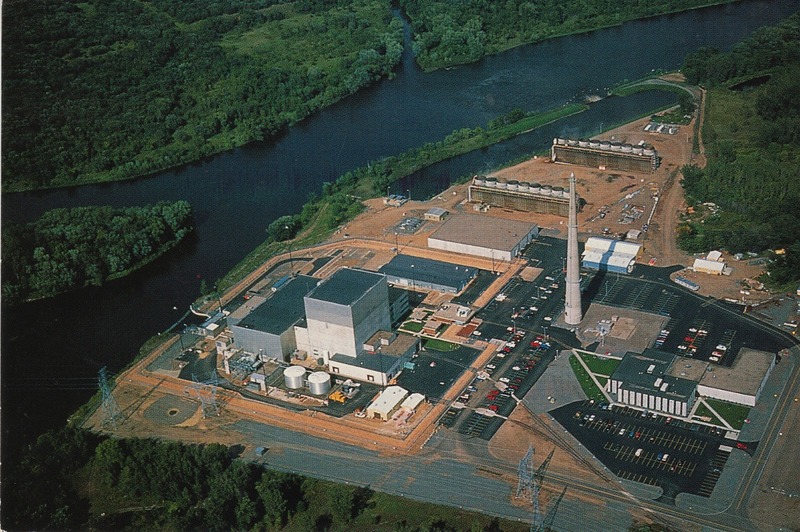 This area is now off limits with no real access to it. 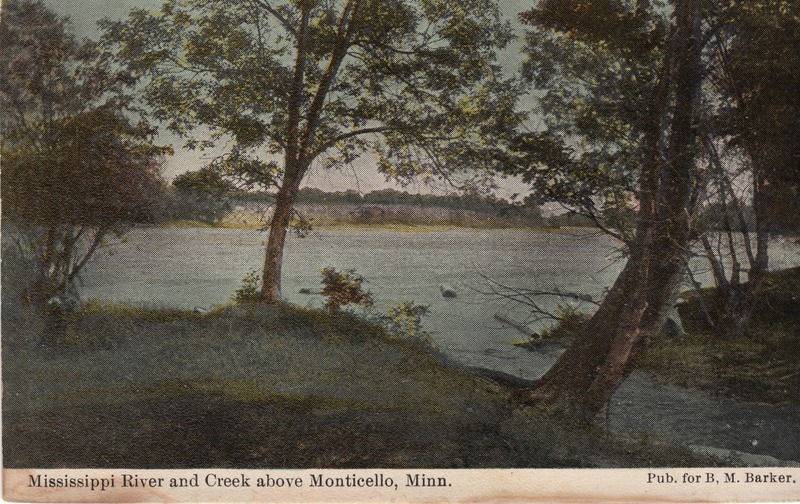 Postcard dated March 3 1910 The E.G. 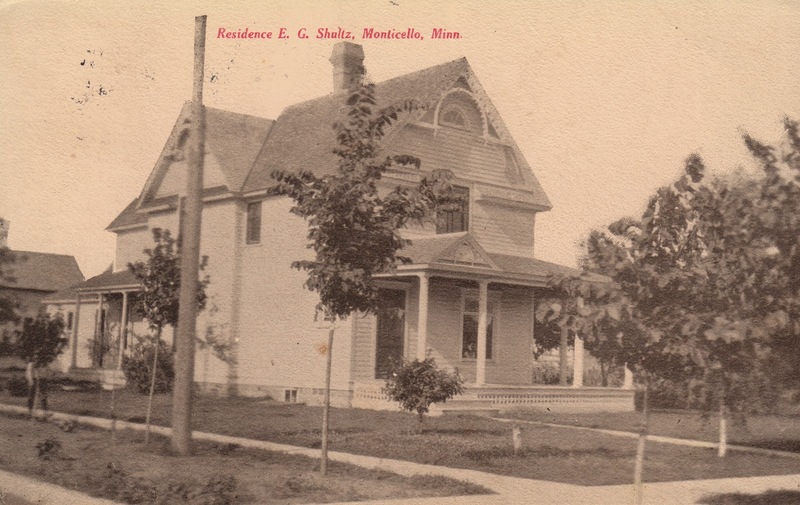 Schultz residence. unsure where this was but i "think" it was on west 4th street by the original Methodist Church. If that is the case this house has since been torn down recently to make way for a parking lot for Cargill. 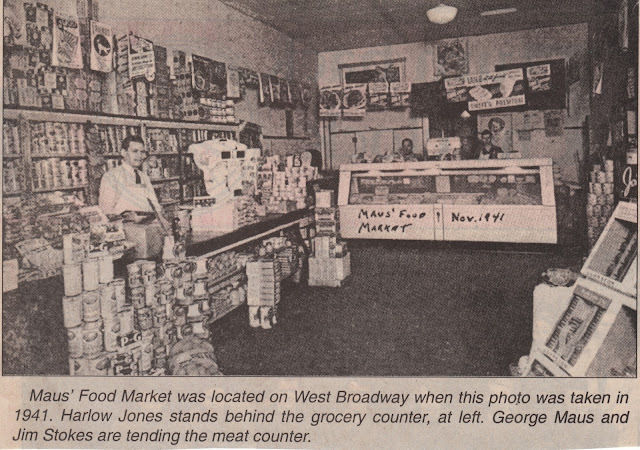 Snapshot of Maus Food store at 224 West 3rd street just west of Walnut after they moved to this location in 1973. 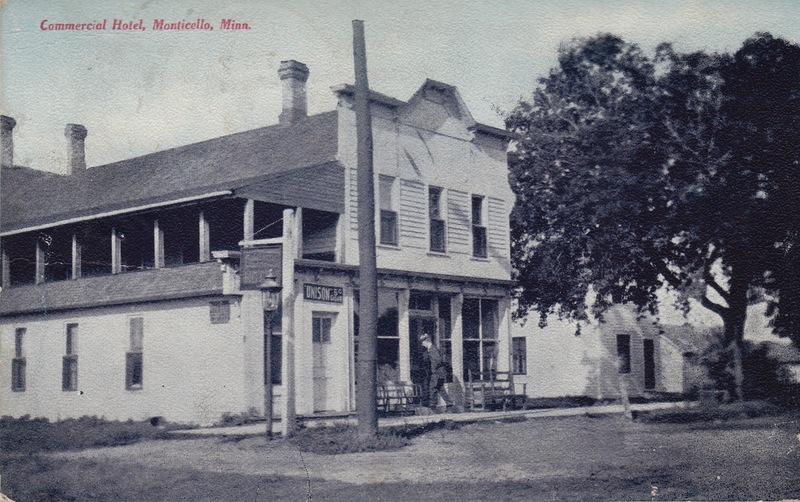 The picture of the Commercial Hotel from 1908 - could this be the building on the corner about a block east of the main intersection downtown.....used to be a bowling alley/restuarant/bar in 1970's - had apartments above. I always heard it had been a hotel. Quite possibly the old Springborg bowling alley one block east but i know that the southwest corner of Walnut and CoRd 75 was the home of a hotel at one time and is currently housing Wright Sherburne Realty and Foster Franzen White Insurance. I was excited to come across this historical collection of my hometown, but after perusing the pages was disappointed to not find any pictures or mention of H.N. 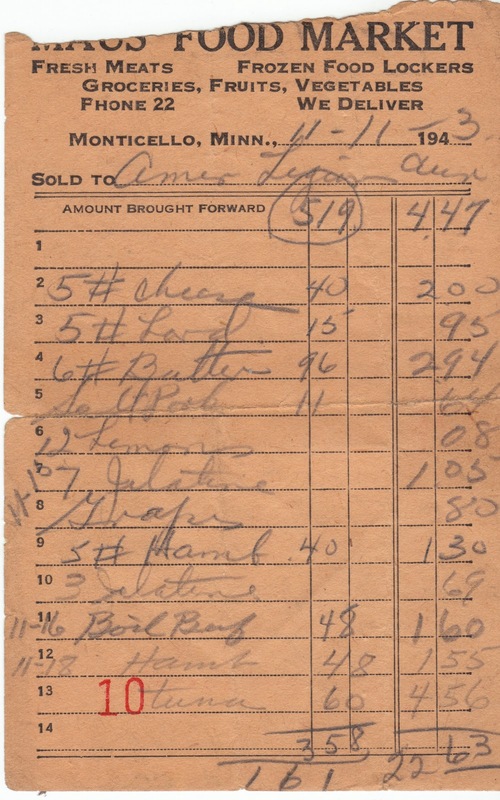 Lungwitz, Dale Lungwitz, George Phillips or Wright County State Bank. It saddens me to think that part of Monticello's history may simply be forgotten. Rest assured that the history of Wright County Bank and everyone associated has not been forgottten. I have spent days with Dale Lungwitz interviewing him on video just a few years ago. I have also gathered dozens of photos that Dale shared with me as part of time i spent with him. I had life long, close relationships both personal and professional with Dale, Jim, and George. 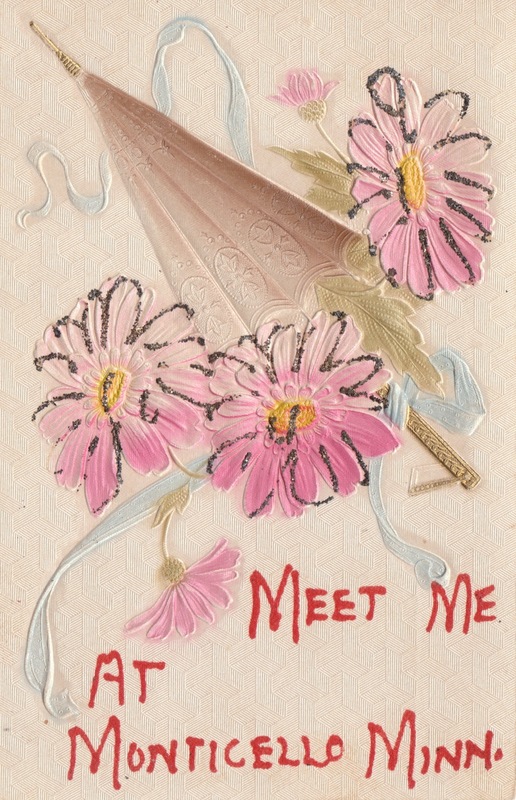 I would welcome any ephemera that you would like to share with us. I did not know who to contact after Dales passing to inquire about sharing items of interest that Dale had in his personal belongings. I would also suggest that you check out the Monticello History Facebook page as I also posted many images that are not always on this blog too. Molly please message me on the Facebook platform to discuss this further. I can share my interview experience with the time i interviewed with Dale.